Photograph from Zahav: A World of Israeli Cooking by Michael Solomonov and Steven Cook. Photography copyright ©2015 by Michael Persico. Used by permission of Houghton Mifflin Harcourt. All rights reserved. This dish happened by serendipity. At Zahav, our Israeli pickles come packed in huge cans with a ton of excess pickle juice. One day, in a passion for brining, I decided to throw some peeled potatoes into that leftover pickle juice. A day later, I drained and fried the potatoes, ending up with the most amazing French fries ever. The potatoes were seasoned from within with a garlicky tang from the pickle juice. Deep-frying can be an undertaking, so when I make this dish at home, I just slice the potatoes into rounds and pan-fry them on both sides in a cast iron skillet until they’re nice and crispy. I serve the potatoes with tehina augmented with harissa, the North African condiment based on dried chiles that’s a staple on the Israeli table. In my harissa, I use ground Aleppo peppers from Syria, which has a fruity flavor and is not screamingly hot, so you can appreciate the pepper’s earthy undertones. I thin the sauce with a little more pickle juice to cut through the richness and echo the flavor of the potatoes. I’ll bet there’s a jar in your fridge, with a lonely pickle or two bobbing in a sea of brine. This recipe is the perfect excuse to put those pickles out of their misery. •	Combine the potatoes and the 2 cups pickle brine in a large bowl. Cover with plastic wrap and refrigerate overnight. When you’re ready to cook the potatoes, drain them well and pat dry with paper towels. •	Add ¼ inch oil in a large skillet over medium heat until shimmering but not smoking. Working in batches to avoid crowding the skillet, add the potatoes in a single layer and fry until brown and crisp on the outside and tender within, about 3 minutes per side. •	To make the harissa tehina, whisk together the tehina sauce and the 2 tablespoons pickle brine. Stir in the harissa – I like it when the sauce looks a bit broken and streaky. Serve the potatoes with the tehina sauce. Harissa is the famous North African red pepper sauce that’s most commonly used to spice up couscous and is so essential to my cooking. Excellent versions are available in jars and tubes. (See Resources, page 359). Here’s our Zahav recipe if you’d like to master your own. We call it by its Hebrew name harif, which means spicy. Combine ½ cup ground Aleppo peppers, 1 garlic clove, 1½ tablespoons red wine vinegar, 1 teaspoon ground cumin, a pinch each of ground coriander and ground caraway, and ¼ teaspoon kosher salt. Blend in a food processor to a course puree. Add ¼ cup canola oil and process for another few seconds. Stop short of making it perfectly smooth. Refrigerated, harissa will keep 2 weeks. This simple sauce is one of my basic building blocks and is so versatile that once you master it, there are a million things you can do with it. The important step here is to allow the garlic and lemon juice to hang out for ten minutes after blending but before adding the jarred tehina. This step helps stabilize the garlic and prevents it from fermenting and turning sour and aggressive, which is the problem with a lot of tehina sauces (and therefore the hummus made from them). Because you’re making an emulsion (oil-based tehina incorporated into water and lemon juice), the tehina sauce can sometimes separate or seize up. Don’t panic! Keep a glass of ice water nearby and add it to the lemon juice–tehina mixture a few tablespoons at a time while you’re whisking, until your creamy emulsion returns. Pour the mixture through a fine-mesh strainer set over a large mixing bowl, pressing on the solids to extract as much liquid as possible. Discard the solids. Add the tehina to the strained lemon juice in the bowl, along with the remaining 1 teaspoon salt and the cumin. Whisk the mixture together until smooth, adding ice water a few tablespoons at a time to thin it out. The sauce will lighten in color as you whisk. When the tehina seizes up or tightens, keep adding ice water, bit by bit (about 1½ cups in total), whisking energetically until you have a perfectly smooth, creamy, thick sauce. Taste and add more salt and cumin if you like. If you’re not using the sauce immediately, whisk in a few extra tablespoons of ice water to loosen it before refrigerating. The tehina sauce will keep for up to a week in your refrigerator and can be frozen. 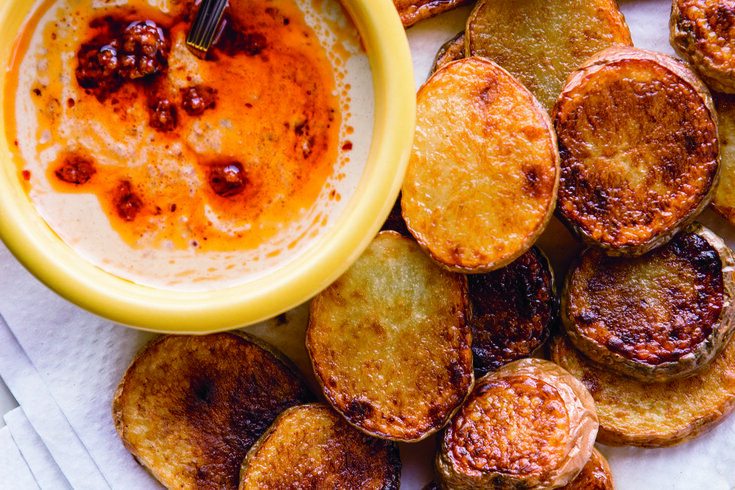 “Fried Potatoes with Harissa Tehina” from Zahav: A World of Israeli Cooking. Copyright ©2015 by Michael Solomonov and Steven Cook. Used by permission of Houghton Mifflin Harcourt. All rights reserved.